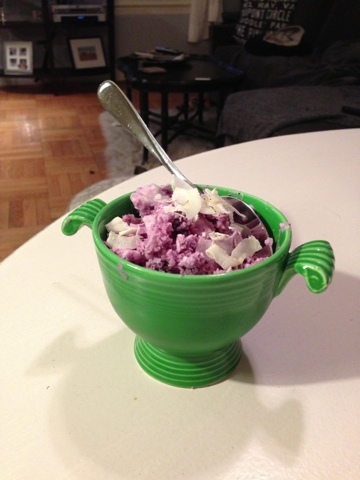 I've had a serious craving for ice cream this weekend, but it is far from paleo friendly thanks to the sugar. I started thinking about how I might turn the cans of coconut milk I stocked up on into something that might fill the bill. Using Angry Asian's Coconut Granitas for inspiration, but 86'ing the simple syrup and adding fruit, my invention was pretty fulfilling! In a small baking dish, pour 1 can of coconut milk. Squeeze lime juice into the milk. Add shredded coconut, to taste. Put in freezer. 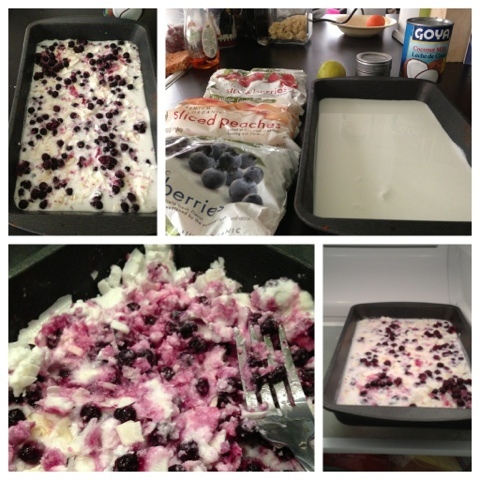 Every 30 minutes, scrape the mixture into a icy-flaky mixture. I only did this twice before I ate mine, but make sure you scrape it every 30 minutes or so otherwise it gets to firm and becomes an ice block. When ready, shave your granitas into a bowl. Sprinkle a little sea salt, coconut flakes and a spring of mint on top. Enjoy! I'd make this again, once I'm done with the #Whole30 challenge. You could sweeten with agave nectar or honey if you're trying to stay away from sugar in the simple syrup. thank you for linking back to my post. Tried these tonight, and added fresh strawberries to the frozen blueberries! Great little Whole 30 approved treat! :) Thanks!